Event sponsorshisp are a vital part to any event marketing campaign, but one of the hardest parts of securing the right event sponsors is knowing where to look. Imagine trying to sell bananas to a flock of pigeons. Ridiculous, right? There’s no way to know if pigeons even like bananas. How can you expect to sell your supply if you don’t have the proper demand? Instead, a much easier task would be to sell bananas to monkeys. Plenty of evidence show that monkeys love to eat bananas. In choosing between the two, going with the latter would be a much more sound business plan. Interestingly enough, the same idea can be applied to finding companies interested in event sponsorships. So, why the random banana analogy? The reason is to illustrate the following point: Sell to those who want what you’re selling. Though a very obvious statement, people can overlook this fact when the need for buyers becomes urgent and overbearing. This kind of tunnel vision is particularly true for event organizers looking to secure event sponsors. The approach should not be to indiscriminately search for potential partners but to find companies who are specifically interested in sponsoring events. It’s a subtle yet significant difference. By focusing solely on companies willing to sponsor events, the search process becomes targeted and in turn yields more favorable results. Of course, there is no foolproof formula to guarantee sponsorship, but by having a more targeted outreach savvy event managers increase their chances of event success. To help form this strategy, here are 10 tips on how to best position both you and your event in front of the ideal sponsors. By having more intention and focus behind the strategy, you’ll have a better chance of securing top tier sponsors which in turn will strengthen your overall event marketing campaign. Before you can start finding the right companies, clearly articulate the differentiating factors of your event. Below are a few questions to reflect on to help get to the core of the event identity. What is the overall vision of the event? What overarching goals are you trying to achieve through the event? What are the values of the event brand? Even if you were to find companies who are interested in the event, you will only win them over once they buy into the event goals and vision. Thus, make sure to have these core factors explicitly defined before beginning the search. Being able to clearly communicate these values will be crucial in helping you find companies interested in sponsorship events. If the goal is to find companies the are interested in sponsoring events, the primary step should be to understand why these companies are looking for sponsorships. In the end, sponsoring an event is a significant investment so it is important to become knowledgeable on the types of event ROI that these companies are expecting to see. Below is a list of reasons that cover why companies seek out event sponsorship opportunities. Increasing social media impressions - Because events are a great platform for social media content, companies see the perfect opportunity to elevate their social media presence through event sponsorship. If your event is particularly well suited for social media sharing, companies will be very much interested in promoting their own social media channels and thinking of ways to push partnered content. If executed properly, this can be a win-win for all parties involved. Collecting customers leads - Many companies are excited at the prospect of gaining more potential customers through event sponsorship. Especially if the attendee demographic overlaps with a target customer base, companies see events as a great opportunity to grow their sales pipeline and increase the number of potential closed deals. Gaining access to specific demographic - Sometimes companies have a difficult time tapping into a certain demographic due to limited resources or general lack of exposure. However, event sponsorships offer a way to get in front of a specific target audience that may have been inaccessible otherwise. Companies are especially interested in sponsoring events if the sponsorship can give the brand the exposure it needs in regards to a specific demographic. There are many other reasons why companies want to sponsor events but these are some of the main motivating factors. Whatever the reasons may be in your sponsor’s case, make sure to be very mindful of the “why” behind their eagerness to sponsor and address those needs as directly as possible. As mentioned before, it is imperative for you as an event organizer to clearly communicate the mission and objectives of your event as you meet with prospective sponsors. Similarly, it is very important for the sponsor to articulate their company mission and brand values to you as the event organizer. Having clearly established criteria for the types of sponsors that you want to partner with is crucial for the overall success of the sponsorship. It's helpful to keep in mind a few questions when speaking to potential sponsors to see if they would align with your event vision. This might seem a bit limiting, but in this case, picky is good. Having a list of criteria will help to ensure alignment between your sponsors' and your event vision. Remember, event sponsorship is not only about asking for financial support. It's about creating a partnership—you as the event organizer are bringing significant value to the table—and as with all partnerships, both sides must be mutually invested in order for it to be a success. Be particular with criteria for sponsors to ensure a successful partnership. You owe it to yourself. Great, you’ve done your due diligence. You’ve articulated event goals, anticipated sponsors’ needs, and established sponsor criteria. Now it’s time to actively search for ideal companies who fit the profile. If you haven’t noticed, the theme thus far has been to be intentional and calculated with your outreach strategy. Continuing with that theme, search for potential sponsors that would be more inclined to sponsor your event than others. A good place to start would be to look up other events similar to yours and to check out their sponsors pages. If these companies were interested in forming event partnerships with these events, there’s a good chance they’ll be interested in yours. If possible, (and if they’re not a direct competitor) get in contact with the event organizer and ask for tips on shaping the event sponsorship package. Conversations like this will provide key insight as to what these companies are looking for. If you’re looking for a larger pool of companies that are interested in sponsoring events, there are plenty of online resources that serve that very purpose. Below you can find a few helpful resources to choose from. SponsorMyEvent is a platform for organizers and sponsors alike to connect with one another for potential partnerships. The homepage features events looking for sponsors with a minimum prices range for each. The site functions as a complete sponsorship management tool, allowing organizers to organize their data as well as process payments all within the platform. SponsorPitch facilitates quick, smart connections between sponsoring brands and sponsorship opportunities. 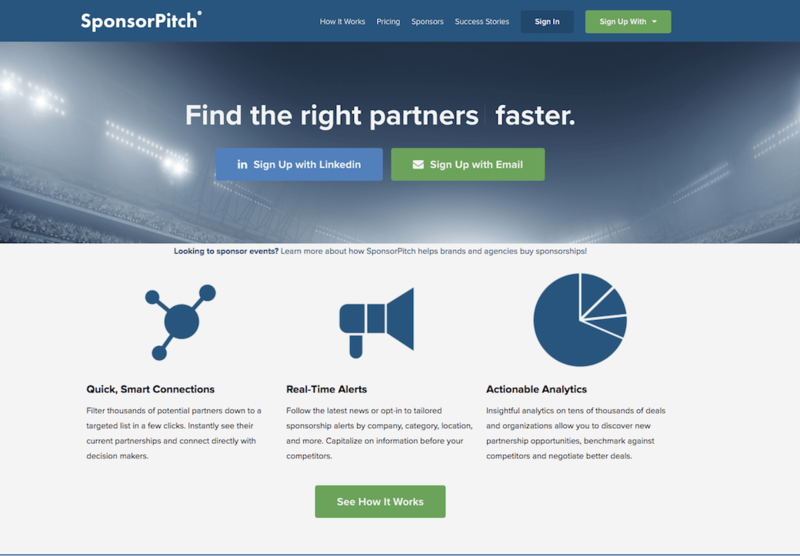 Unlike many other sponsor search platforms, SponsorPitch provides analytics to help both organizers and sponsors make smarter decisions as well as analyze their competition. SponsorPark is particularly geared towards event organizers, requiring all organizers to post event sponsorship proposals and then wait to be contacted by interested sponsors. Companies can also search for sponsorship opportunities through the “opportunity search” bar which allows them to specify the category, location, and price range of the sponsorship. 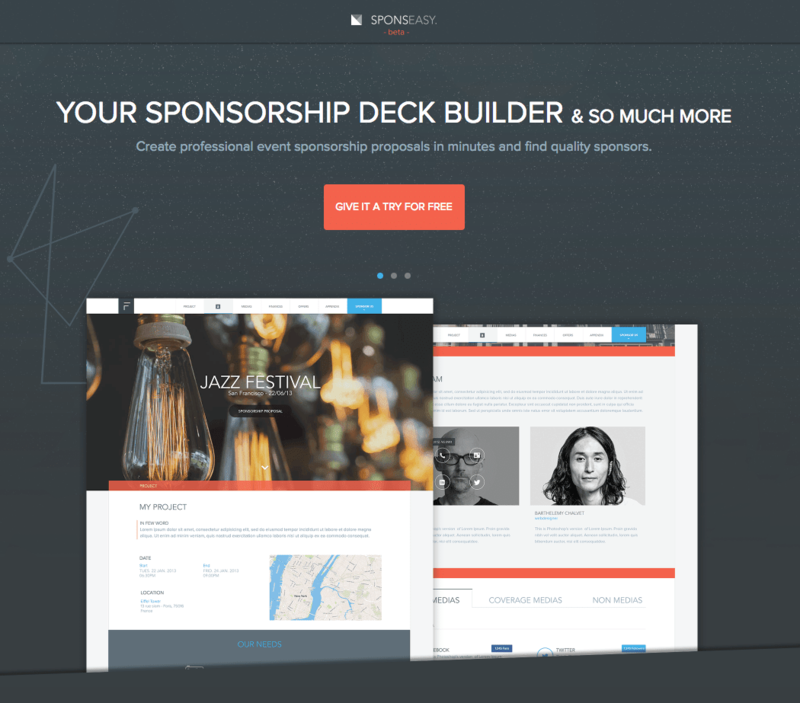 Sponseasy can be viewed as a Squarespace for sponsorship proposals. Event organizers create an aesthetically appealing proposal and then posts it on the network for potential sponsors to look through. The site’s emphasis on visually captivating proposals is what makes it stand out from other sponsorship platforms. These are all great ways to get right in front of companies who are craving event partnerships. Each of these resources help you to craft the ideal event sponsorship package while making meaninful connections with event sponsors. In the end, companies interested in sponsoring events must also be in a position to do so. A company might be very eager to sponsor your event but ultimately may not have enough resources for you to feel confident about the partnership. Here are three qualities to keep in mind when looking for companies that are both interested and eligible to be sponsors. Companies with sufficient budget: The main reason for sponsorships is to cover costs that the event organizer could not cover otherwise so make sure that your potential sponsor has a large enough budget to offer financial support. If not, you may not be willing to offer enough value from your side which then results in an unsuccessful partnership. Companies with Advertising/Marketing Departments: You’ll notice that companies with separate advertising or marketing departments oftentimes set aside a budget for sponsorships. In some cases they may specifically set aside a budget for event sponsorship. Partnering with companies like this will make for an easier and more streamlined search process. Companies through referrals: Once you’ve secured some of the first few sponsors, enroll them into a referral program that incentivizes them to promote your sponsorship opportunity to other companies. This way, you’re automatically introduced to qualified sponsorship candidates and will have much of the search being done for you. Showing interest in sponsoring means very little if the company does not have the resources to do so. Keep these points in mind in order to avoid such situations. In the end, it will only be a handful of people who make the ultimate decision to sponsor your event. With that in mind, make sure to reach out to those individuals sooner than later. Tools such as LinkedIn and Hunter.io are helpful for targeting these relevant stakeholders. Once you find their contact info, send them personalized event sponsorship emails that will pique their interest. The more you know about each stakeholder, the more you'll be able to craft the ideal messaging to further persuade them to become an event sponsor. Know the key players and know how to grab their attention through effective emails. Companies interested in sponsoring events will always be interested in the type of data you’re able to collect. Just as event data is important for you as an organizer, that same event data will help companies better understand the impact of their sponsorship and how to follow up with the attendees. Presenting valuable data to potential sponsors will be pivotal in securing their partnership. The best way to go about collecting such data would be through a robust and well-integrated event software. A full-stack event management platform would provide the tools and features necessary to gather the event data that will be valuable to companies interested in sponsoring your event. Don’t forget that securing sponsorships is not a new endeavor. Countless event organizers have undergone and achieved the task before. Thus, don’t overlook the value of your event organizing network. Reach out to those who you feel you could learn a lot from. As long as the organizer is not a direct competitor, connecting with your peers regarding is a great way to learn new insights as well as add to your list industry contacts. Finding companies that are interested in sponsoring events requires both resources and experience so if you feel you are lacking the latter, build upon it by having conversations with those who have more experience. Learning about other event sponsorship examples may serve as a source of inspiration for your own strategy moving forward. It’s easy to get bogged down by the pressure to secure sponsorships but don’t let that distract you from your main focus. At the end of the day, your main goal is to organize a spectacular event. Yes, sponsorship is important but they pale in comparison to your mission and vision as an event organizer. Always remember that event sponsorship should complement your overarching goals, not replace them. And ultimately, the best way to find stellar sponsors is to have them come to you. If the event is amazing, top tier companies will be pitching you sponsorship ideas. Again, the best sales strategy is to sell what the customer wants. By creating a stellar event experience, you’ll ensure that the product is worth buying. Securing event sponsors is never an easy task but with the right resources and strategy, the endeavor could prove to be much simpler and more enjoyable than you anticipated. These 10 tips will surely help you find the right event sponsorships while attracting them to you at the same time. Looking to learn more about event marketing best practices? Click the button below. Your brain will thank you!